Issuing the No.4 Rifle - a lack of foresight? Weapons go through a process of development in the light of war experience, either to improve their battlefield performance or to speed up and economise on manufacturing time and resources. Producing new weapons is one thing; issuing them to the troops is another. For 1st Canadian Infantry Division the exchange of nearly 10,000 new rifles for old ones in 1943 was not a pain-free process. The graphic below shows the two rifles; the top one is the Lee Enfield No.1 Mk.III, while the one below is the No.4 Mk.I that began replacing it in the British and Canadian Armies during World War Two. Both fired the standard British .303" round. The nomenclature of British Army rifles is somewhat confusing, but a potted history may be of use. The Mark I Short Magazine Lee Enfield (SMLE) rifle was accepted by the British Army in 1902 after it had learned some hard lessons during the Boer War. The Mark III SMLE was the workhorse infantry weapon during the Great War, although the War Office had been planning to replace it with what later became the Pattern 1914 (P14) rifle. The complexities of mass production and supply meant that although the P14 was manufactured and issued, it could not replace the SMLE during the war. In about 1916, the SMLE Mk.III was modified in order to simplify production. Long range volley sights and a magazine cut-off plate were omitted from the design, as these were relics of colonial warfare unnecessary for close-range trench fighting. The modified rifle was known as the Mk.III* (pronounced "Mark 3 (star)"). Between the wars, new developments occurred and the nomenclature was changed. The .303 SMLE lineage became known as "Rifle No.1", .22 calibre weapons became "Rifle No.2" while the P14 family became "Rifle No.3". The Mk.III* rifle therefore became "Rifle No.1 Mk.III*". The No.4 Mk.I rifle was officially adopted by the British Army in 1941, partly to assist mass production. There were a few differences from the SMLE; the No.4 had a heavier barrel, the muzzle of which was exposed, as seen in the photo at right. The SMLE's rear sight was placed halfway down the weapon and comprised an open V-notch for the foresight to be aligned in. In some lighting conditions it was hard to discern the notch and take effective aim, so on the No.4, the sight was moved to the rear of the receiver, right in front of the firer's eye. An aperture sight made sighting far easier; the No.4 had either a simple L-shaped battle sight graduated at 300 or 600 yards, or more complex graduated "leaf" sight. 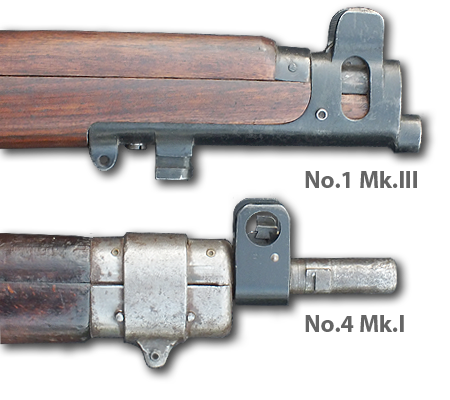 The SMLE nosecap was omitted, and the new No.4 Mk.II bayonet fixed by a socket and lugs onto the barrel itself. The photo below compares the SMLE with 17-inch bladed 1907 Pattern "sword" bayonet, with the 8-inch No.4 Mk.II "pigsticker" spike. The latter was simpler to manufacture and made the weapon less muzzle-heavy when firing with fixed bayonets. New military kit is never issued universally or speedily after its introduction; it's a gradual process as supply struggles to catch up with demand. The war diaries of some of the Canadian Army units mention the delivery of their No.4 rifles; for example, the Perth Regiment, an infantry battalion with 5 Canadian Armoured Division, were issued theirs in August 1942. However, we're going to focus on 1st Canadian Infantry Division for two reasons; firstly, they documented how the transfer happened and secondly, the process took place in the town that I grew up in. In January 1943 1 Canadian Division was stationed in the East Sussex area, and as yet unaware that they would be invading Sicily in July. 1 Cdn Div is to be issued with the new Mk.IV Rifle. 9,908 Mk.IV Rifles are to be issued and there will be an equivalent withdrawal of Mk.III Rifles now held by units. Major Fraser, DAQMG, completed arrangements to take over the Armouries and subsidiary buildings at Hailsham to set up a central depot where the new rifles would be received and the old rifles turned in. Cleaning and inspection of the new rifles will be carried out at the Armouries at the time of issue. Rifles are expected to arrive by rail on 21 Jan 1943. Holdings of Mk.IV rifles will amount to 9958 against the rifle establishment of 11,783. Note how the rifle is mistakingly referred to as the "Mk.IV" instead of the No.4 - this is a common error among the war diaries. The exchange of 11,783 SMLEs for 9,958 No.4 rifles is probably accounted for by the Canadian Army reforming along British lines in February 1943 and possibly a larger number of submachine guns (such as the Sten) being issued. The photo below shows the drill hall at Hailsham where I believe the armouries were established. 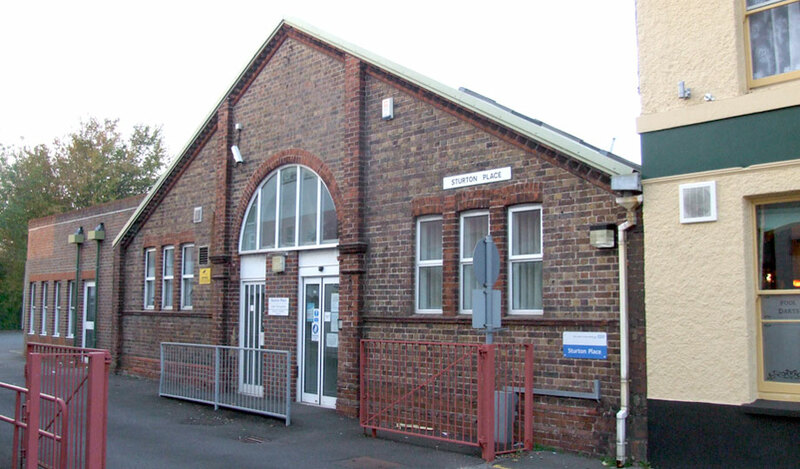 There was another drill hall built in the 1930's (now the ambulance station), but this is usually referred to as the "new drill hall" in the documents. The old drill hall is Sturton Place, hidden behind what used to be the Terminus pub, just over the road from the old railway station. The first batch of 2,620 rifles arrived at Hailsham Railway Station on 22 January, a day later than planned. The issue was staggered; obviously 10,000 men didn't suddenly descend upon Hailsham, each to hand in an old rifle and be given a new one. Battalions made their own arrangements to exchange en masse and then issue the new No.4s to their troops at their leisure. The 48th Highland Regiment sent 35 men from "D" Company to Hailsham on 21st January to count, clean and inspect the new rifles for the entire 1st Canadian Infantry Brigade. This operation took six days, but the 48th Highlanders and the Royal Canadian Regiment were issued their new rifles on 28 January. Brigade HQ and the Hastings and Prince Edward Regiment (who were out on exercise on the 28th and presumably still using their SMLEs) collected theirs the following day. 2 Canadian Infantry Brigade were quite not so organised; the three battalions picked up their rifles on three successive days, but the dirty work of cleaning the rifles was left to each battalion. The Battalion was issued today with new rifles No.4 Mk.I and the new 7" bayonet No.4 Mk.II. As is usual with new weapons they were loaded down with grease and the troops are going to have one H------ ("Helluva"??) time trying to get them clean. For the 4th Recce Regiment, the main problem was that after handing in their SMLEs, they had no rifles for five hours! 3 Canadian Infantry Brigade successfully exchanged their rifles 29 January - 1 February. By 2 February, 6,000 No.4 rifles had been issued, with 3,108 outstanding. On the same day, 11 SMLEs were stolen from a train after being dispatched from Hailsham! Three days later it was reported that the work was now complete, with armourers having inspected 9,910 No.4 rifles and 9,908 SMLEs in three weeks. For some reason, these numbers do not tally with those given above. Despite the apparent efficiency with which the changeover had proceeded, Divisional HQ reported on 29 January that the Ordnance Workshop had set up in Hailsham to effect "minor repairs" to the No.4 rifles and the incoming SMLEs. This indicates some underlying glitches with the new rifle. Reaction to the new rifle was mixed; some units saw a dramatic increase in marksmanship. For one platoon of the Hastings and Prince Edward Regiment on 3 February "the results were exceptional, most firers averaging 80 per cent above their previous scores with their old rifle." Princess Patricia's Canadian Light Infantry also reported favourably on 28 March: "Scores showed two days of good firing, and that the new rifle is a great improvement on the old Lee Enfield." The Seaforth Highlanders were skeptical however - 25 Jan: "the general impression is that these rifles are better than the old SMLEs only because they are new." They were not the only battalion to have doubts about the No.4 however. The Edmonton Regiment having picked up their new rifles on 26 January, began "zeroing" them on 1 February at the Holywell Range at Eastbourne. Zeroing entails adjusting the sights so that, at a particular range, the sights and the impact point on the target coincide. Rifle zeroing continued and it seems as if 30% need adjustments. Trigger actions are touchy and magazines seem sticky. The new battle sights seem to call for another zeroing method. The Armourer Sergeant suggesting that 200 yards would be the distance to zero at so that accuracy might be good between 100 and 300 yards. Holywell Range was only 30 yards long so unsuitable for the armourer's suggestion; a week later the Battalion was at the Hawkenbury Ranges near Tunbridge Wells, at which most of the Division would be firing during this period. New rifles being zeroed on Ashburnham range by means of an improvised mount made from a vice. Rifles found to be in need of considerable adjustment and repair although new. Considerable difficulty experienced with magazine springs sticking. 2 Canadian Field Park Company had some good shooting, but also experienced the magazine problem: "A very successful day at the range with ideal weather. The shooting with the new Mk.IV rifles was quite good, although some jams were caused through defective magazines." Ten days later the Company despatched 100 of their rifles to 1 Field Company's armourer for zeroing and inspection. The Lee Enfield magazine (photo at right) held ten rounds; a flat zig-zag spring kept the platform upon which the rounds rested pushed as high as possible. 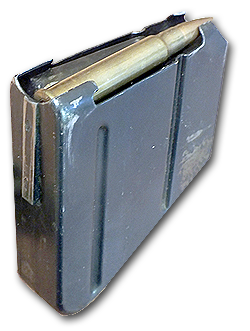 As the firer closes the bolt, the top round is stripped from the magazine and fed into the chamber where it is fired when the trigger is pressed. 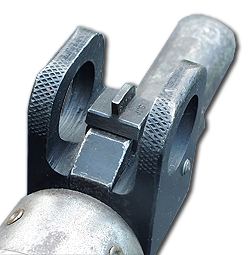 If the spring is not strong enough to push the rounds up, or the platform sticks, the bolt rides over the top round without feeding it. (a) Magazines and Magazine Springs are faulty in a number of cases, so that some bullets are not automatically forced into the chamber. (b)There are two types of Blades, Foresight, one which has a foresight screw which holds the blade in place and is satisfactory, but the other type which has no screw and has the blade tapped in and is unsatisfactory as a large number of blades fall out in the field. 2. This does not appear to have been discovered or reported by REME (Royal Electrical and Mechanical Engineers) Workshops. The Divisional Commander was not surprisingly concerned about the troops losing faith in the weapon; the Sten gun and Boys anti-tank rifle were two examples of weapons with bad reputations, and not all them unfounded. As 1 Canadian Corps personnel were away on a major exercise, the Division contacted the British Ordnance depot at Weedon, Northamptonshire, as the rifles were of British manufacture. The response was that Weedon were aware of the magazine problem, as it had been commonplace with early issues, but the missing foresight problem was a new one to them. Faulty magazines were to be exchanged and Weedon was to investigate the foresight problem. It was a serious problem; without the foresight blade (photo at right), you can't possibly hope to hit much beyond point blank range. As a stop-gap, a supply of foresight blades was sent from Weedon, as commanders were asking questions about the problems. The complaints dragged on into March; workshops were ordered not to issue weapons with defective magazines or foresights, and REME top brass visited to inspect them. Reports came in from units regarding the Number 4 Mk I rifle about which there has been a lot of talk as to its poor manufacture. However, from the returns received, it would appear that people on the whole are fairly well satisfied with it and it is only a question of people getting to know a weapon about which they are not fully conversant and therefore do not take to it very readily. I think this is a fair assessment; a couple of issues, one of which was known about and perhaps could have been picked up before the rifles were issued. The problem appeared to be limited to the second and third batches of rifles and, it would seem, the issues were ultimately resolved. Soldiers are notorious for complaining about any new weapon, but don't forget that as many units quoted above praise the No.4, as raise issues. The complaints were entirely justified, but they were fixed, and the No.4 rifle proved itself a reliable battle rifle and remained in frontline British service until 1957. The photo below is captioned "Soldiers of the 3rd Canadian Infantry Brigade run into snipers and machine gun fire, Campochiaro, Italy, 23 October 1943." Why have I included it here when my research is about the Allied armies in East Sussex? Because events in Sussex had an impact beyond the shores of Britain. 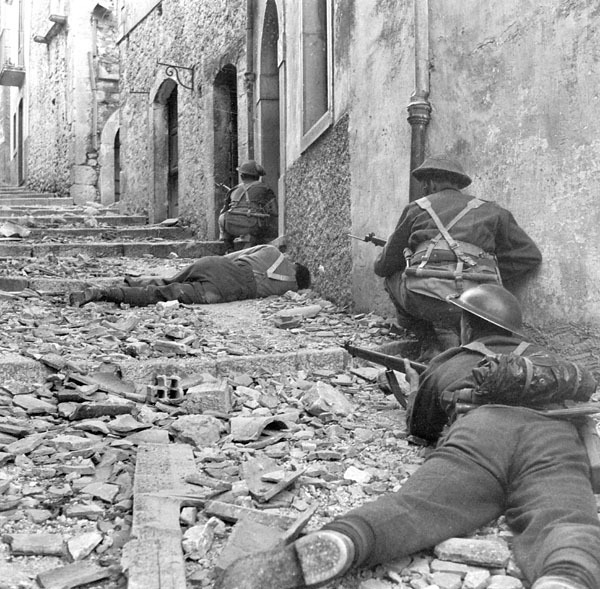 From now on, whenever I see a photo of men of 1st Canadian Division in Sicily, Italy or the Netherlands, I'm going to consider that the rifles they hold quite possibly went straight to the division from a building just down the road from where I grew up!